Welcome to the one-of-a-kind Kaleidoskop Bar in our spa hotel! Here you will find extravagant cocktail creations as well as the classics. Enjoy one of our delicious alcoholic or non-alcoholic cocktails. A fine wine list and selection of spirits complete our offer and make for a perfectly indulgent evening! In our hotel by the spa, you can unwind and ring out the day with a view of the turquoise-coloured waves and many palm trees. 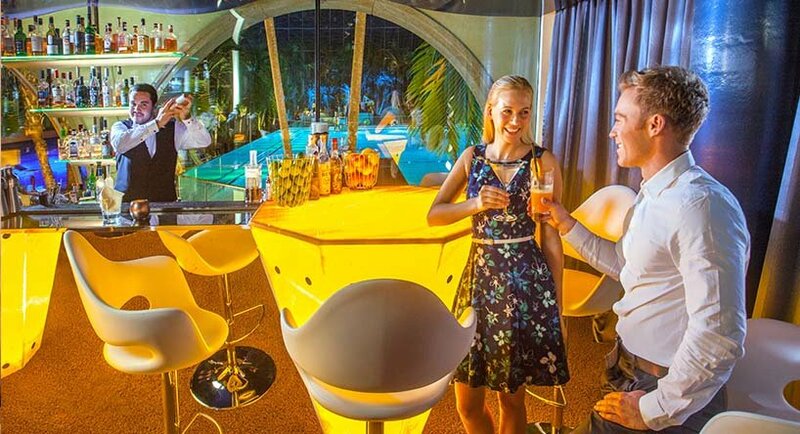 Experience the exotic holiday feeling in our lobby bar – as a visitor of Therme Erding or as an external guest. Let us whisk you away and enjoy the end of your day in the extraordinary ambience of the Kaleidoskop Bar! This year we are celebrating 5 years of Hotel Victory Therme Erding! Especially for our anniversary we have a very special cocktail creation for you: Enjoy our anniversary cocktail "Victory Rubin", which awakens a pure summer feeling with fruity strawberries, Havana and fresh lime juice.